Women often forge deep and lasting friendships with other women, some within minutes of meeting one another. But what about the men? Do they get as close to their male counterparts as women do with their gal friends? How do men feel about their close friends? 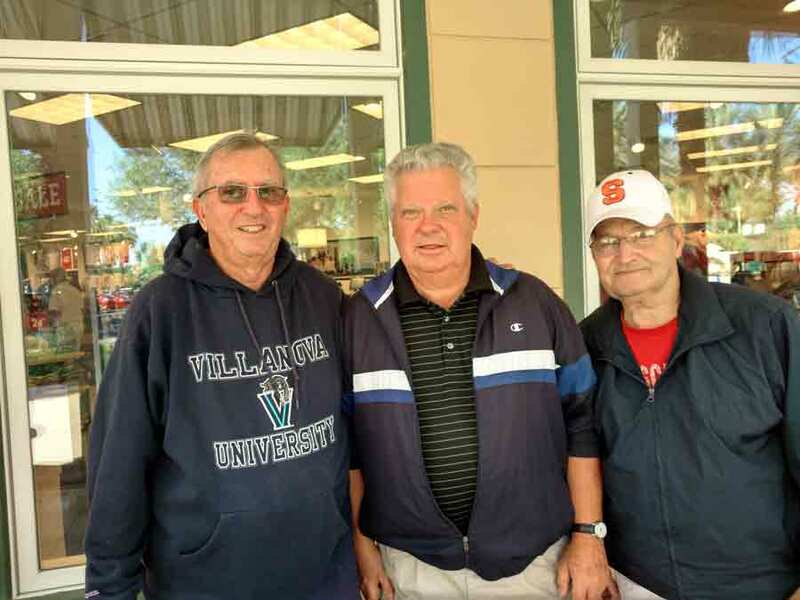 When asked how their group got started, Philadelphia transplant Tom Salerno spoke up. “It started with a Pittsburg hat,” he says. “A guy that sat here all the time had on a Pittsburg hat. Then another guy with a Pittsburg hat joined him. More men joined in. As men walked by or were seating themselves, someone would invite him over. What do they talk about each morning? “We razz each other a lot,” Tom says. “Kinda like a roast thing. John will say something and just for kicks we’ll disagree with him. But he might be right once in a while. “You can’t really describe what we talk about each day because it depends on who you sit next to. It’s not like a forum where somebody gets up and talks to the group. ” How do male friends differ from their female counterparts? “We’re not as emotional as women are,” John offers. “Even with tragedies, we tend to bring a little levity to it, you know, to make people feel better. We men do get emotional but we’re not as outward about it as women are. ” Pittsburg part-timer Ron Demsher said the first time he came to Starbucks and saw the group of men, he just joined in. “When I first came to this table, we were strangers,” he says. “Now we’re all friends. We even got our wives involved. That’s what it’s all about.” Friendship.